Source code from this posting was taken from http://java.sun.com/developer/technicalArticles/xml/WebAppDev3/ with some minor replacement needed for Apache Tomcat 6.0.20 (latest as of this date) and more details on how to run the application. This application is used as a showcase for jsp custom tag. Its functionality is create custom tag for jsp to display string in lowercase. We created customtags directory under webapps (which is needed for an application to be executed by Tomcat). Pay attention to file mytaglib.tld, this file is used as tag lib descriptor to describe descriptor for taglib. 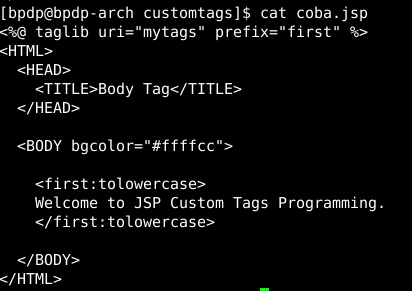 From all of the files above, you should know the relationship between taglib uri="mytags" prefix="first" (in coba.jsp) with mytags (in web.xml).